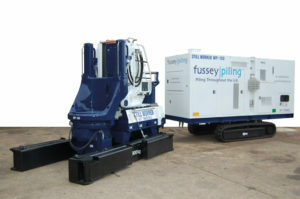 Fussey Piling have bought a new Kowan Still Worker WP-150. Sheet piling specialists, Fussey Piling, pride themselves on having a well-maintained fleet of the latest sheet piling equipment available and regularly update their Still Workers to ensure they are able to meet the demands of modern construction sites. This is their eighth new Still Worker WP-150 and is packed full of the latest features to ensure they are up to date with site requirements including no working at height, and the exclusive mast tilt/self leveller for fast, precision piling.